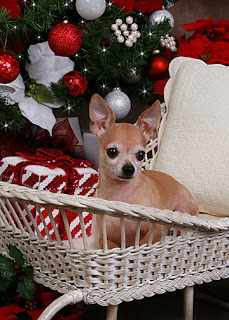 Well, I'm getting ready for this weekends start of the Santa Season and the tree is decorated and of course I had to take a few test shots, the only semi willing subject was my Chihuahua, Petey. I couldn't get Santa to dress up for test shots, so this will have to do, but it gives you an idea of the color scheme. No surprises here, simple red and white Christmas tree, with gifts underneath, the little kids will sit in the sleigh, with or without Santa on the floor behind them, bigger kids can sit on the floor with Santa or stand by him in his rocking chair. We do take a variety of shots and poses, depending on the age of the child and how willing they are to have Santa moving around them. See you all Saturday! 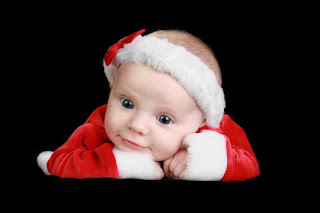 Just look at this little Santa Baby! This is Harper and isn't she the cutest little thing! She's only 8 weeks old and she really showed her stuff in the studio at her session! Here is Madison and Maddox, Madison has been coming to me since she was a tiny baby and she's grown up right before my eyes, now little Maddox is already turning one year old and isn't he the most handsome fella! 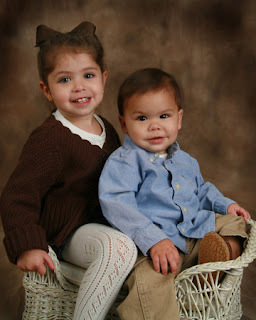 It's amazing how fast time flies and these babies grow up into big kids!